I got lots of tomatoes this year in the garden, but the summer was not long enough to turn them all red. I had to pick many green tomatoes before the rainy season came. But there is no waste, they can be preserved, as I learned it from my mother. Thank you, mum! Collect all these vegetables: green tomato, white cabbage, onion, cucumber, carrot, or anything else you like. Wash, then cut or chop them finely - preferably with a mini chopper. Measure the vegetables and count the other ingredients accordingly. 3 kg vegetables needs 150 g sugar, 40 g salt and 16 ml 10% vinegar. Spices are optional: you can add ground pepper, coriander, mustard seed, cumin or whole bay leaves. Mix it well and let it stay in a cool place for 24 hours. Stir the mixture occasionally and it will release plenty of juice to soak. You can keep it in fridge up to 3 months. Wash and chop roughly 2 kg green tomatoes. Cook it in a pot until becomes a bit softer. Mix with a hand blender. Add 650 g sugar, 1 whole vanilla bean, 1 lemons juice and zest. Cook it slowly for about 1 hour. Cool it down, add Atamon (or other preservative) and pour it in bottles. Wash and chop roughly the following ingredients: green tomato, apple, onion (peeled), mild or hot chilli, garlic (peeled). Combine with salt, brown sugar, clove, whole cardamom, whole anise seed, cinnamon, ginger pulver and apple cider vinegar. Pick ingredients and choose proportions according to your taste. Posted in Preservation. 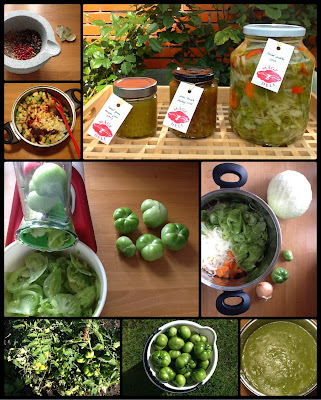 Tags: chuthey, green tomato, marmalade, mixed pickles on 19/10/2014 by Maagedeli.